Fighting Talk II – Do you speak Autism? Since my last post I have received some fantastic advice on how to go about fighting the LA’s decision to reject our request for a special school placement for James. Our local parent partnership, Supportive Parents, have been fantastic, as have Springboard Opportunity Group, and many of the parents that have commented on my blog. The best piece of advice I’ve received is to know your code of practice. This process is a huge learning curve for me, and I only regret that I wasn’t fully aware of the importance of this earlier. The Code of Practice details the statutory duties that LAs have to meet in their SEN provision, in other words, what the law says they HAVE to do… so I never for a moment imagined that the LAs themselves might not make it a priority to actually adhere to it! The first email I sent to the LA (which one week on, they still haven’t responded to, by the way) was very heartfelt and said what I needed to at the time, but it was possibly a bit of a knee- jerk rant. Not that there is anything wrong with that, of course. But since then, I’ve learned a thing or to about how to approach this in such a way that the LA have to listen. Why? Because I’ve based my argument purely on concrete evidence about James that they can’t argue with. I’ve also demanded that they prove that their decision doesn’t breach the SEN Code of Practice. Which I believe it does. I’m publishing this letter as a blog in the hope that it might help other parents in my position having similar battles (I’ve had to take names and stuff out, obviously). But seriously, if you know where to look, there is lots of help out there. Your local parent partnership have a duty to provide you with impartial advice; IPSEA is a really useful resource for free legally based advice to families who have children with SEN, and the NAS have an education rights service. Make sure you get the support you need to get the support your child needs. Oh, and if like me you are just a bit bloody minded, get the local press to write a story for you. Tee Hee! Further to our conversations last Thursday, my husband and I would like to request clarification on some of the points made. Please could you explain on exactly what grounds the panel have based their decision to turn down a request for a special school? Looking at the evidence submitted to the panel we find it impossible to understand how our preferred school could be rejected on any of these grounds. As such, we believe you are failing to adhere to the SEN Code of Practice. We would like the LA to explain how they evidenced their decision in line with the Code of Practice. Two schedule of growth skills (SOGs) assessments carried out on James at age 30 months and 48 months both showed his cognitive development to be at 50% of his chronological age. ‘James obviously has the features of Autistic Spectrum Disorder and he has some learning difficulties. He also has sensory difficulties.’ (Community Paediatrician). ‘James often appears unaware of his peers’ (EP). ‘James never engages in play with other children’ (JW). ‘He will need a highly differentiated environment as his communication difficulties will require highly specialist support..specialist in class teaching/ support staff, skilled and experienced in working with children who have social communication and language difficulties. . . A suitably experienced staff member to be available to deliver specific programmes set by the speech and language therapist’. (SLT). In light of the evidence given above, the idea that our preferred school could be considered ‘unsuitable’ for James’ ability, aptitude or SEN is totally unfounded. 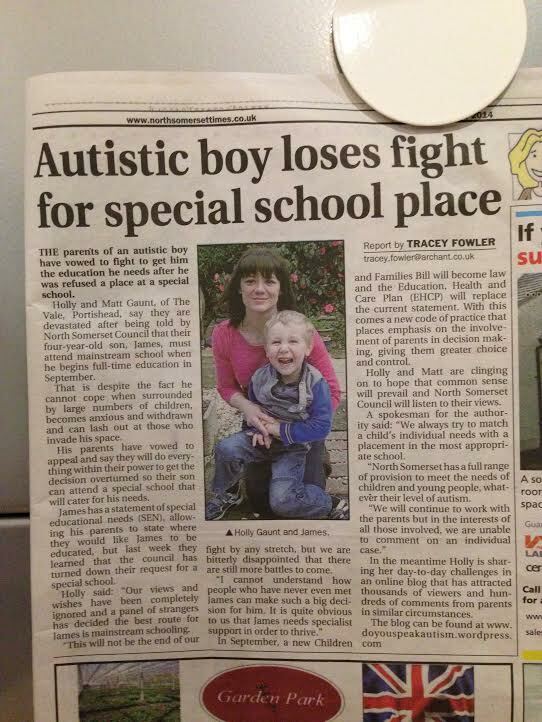 It is quite clear from the advice that James has complex special needs and should receive highly specialist support. Our chosen school is without doubt the best placed to deliver the differentiated curriculum and specialist support that James needs. Regarding our preference being incompatible with the efficient education of the other children with whom the child would be educated, or with efficient use of resources, again we firmly believe this is NOT the case. It is highly likely that staff in a mainstream school will not be experienced in catering for James’ needs and will therefore need to undertake extra training at a cost to the school/LA. The teaching staff at our preferred school already possess this experience and skill, therefore a placement there would be a more efficient use of resources than a mainstream placement. Additionally, we would point out that James’ unpredictable, potentially harmful behaviour towards other children; his poor listening and attention skills, and his difficulties engaging in adult led activities not of his choosing (ALL of which are more pronounced in a mainstream environment) are likely to result in disruptiveness which will arguably impact on the education of the other children in his class. This is further evidence of the unsuitability of a mainstream placement for James. The suggestion that James will develop better communication and social skills through exposure to typically developing peers is not evidentially supported in the advice submitted to the panel. James has been exposed to language modelling since birth; yet his language development has still been disordered. James’ disordered language development is as a result of his autism, not lack of exposure to language modelling. To suggest otherwise indicates a lack of reference to his Autistic spectrum disorder which we find most concerning. Once again, we would like clarification of the grounds on which the panel have based their decision. We would also appreciate the letter promised to us last Thursday, explaining the appeals procedure, and an amended proposed statement in light of my other recommendations, being sent to us without further delay. Lastly I note that I have so far received no acknowledgment of my last email whatsoever which I do find rather discourteous. I would appreciate your swift response to this email. This entry was posted in Autism, Behaviour Management, Disability, Parenting, school, Uncategorized and tagged #ASD, #excluded, #inclusion, #parenting #autism #autisticspectrumdisorder #disability #behaviourmanagement #, #RuledOut, #SEN, Autism, children with autism, Disability. Bookmark the permalink. This is just so clear and to the point. I would be amazed if your son doesn’t get the place he obviously needs.This blog is so valuable to other parents who will also (unfortunately) have to fight for their childrens education. I hasten to add after fighting a local schools, North Somerset LA, professionals since the day he started school until he was eight years old we home schooled and had a shock at the mess he was in covered up. He has asperges, dyspraxia, sap, anxiety disorder and thanks to BIBIC and Debbie Quinn SEN Independent Educational Advisor (ex SEN head teacher) plus seventy pages of evidence we won a statement, don’t give up as our children deserve better than the outcomes and opportunities not just in school that they offer!! That is s fantastic letter, it points out exactly what James needs and how his needs will be met in your preferred school and exactly how they won’t be met in mainstream. I wish you all the best and hope the decision goes your way. Never stop fighting for what you know is best for your boy. I wish we had the option of sending our son to special school from day 1, instead he had to totally fail at mainstream before he was considered for a special school, moving him and fighting for that place was the best thing we did for him.